LMS Principal Dr. Tiffany Taylor-Johnson and School Counselor Janey Worthington with laptops purchased by the LEF. “Laptops for Learning” provides technology that enables students at Ladue Middle School (LMS) to access course materials from home, while giving parents/guardians a tool they can use to support their students’ school success. The idea for the grant was submitted by LMS Principal Dr. Tiffany Taylor-Johnson and LMS Counselor Ms. Janey Worthington. Diversity, Equity and Inclusion (DEI) is part of the Ladue School District's Strategic Plan and one of Ladue Middle School’s initiatives. The LEF supports the district's ongoing efforts to be responsive to the significant diversity of our school community as they continually review programs, activities and curricula to maintain an equitable and inclusive environment. The grant’s effectiveness has been increased by the oversight of the Ladue School District’s Director of Technology Rob Highfill and LMS Technology Specialist Karl Kindt. “Mr. Highfill made us aware that students need Wi-Fi access, not just the laptop, to succeed at home,” Dr. Taylor-Johnson explains. “Our Tech Specialist, Mr. Kindt, has been key in educating families and monitoring student use. We are starting to track data to help us determine the grant's impact. Parents, students, and staff have been extremely appreciative, as it's one more way to strengthen the home/school partnership." For details about the more than 130 grants funded by the LEF, please visit our website. The free screening will take place on April 17 from 6 to 8:30 p.m. at the LHWHS Performing Arts Center. Funded by a grant from the LEF, in partnership with the Clayton School District. A Q&A session will follow with the film’s directors (Clayton alumna Leah Warshawski and her husband, Todd Soliday) and Sonia Warshawski’s two daughters, Regina Kort and Debbie Warshawski (a St. Louis native). RSVP for the Big Sonia screening. The Knitting for Dr. King grant teaches fourth grade students both the art of knitting and the value of community service. Students’ final projects are donated to area nursing homes as part of the Dr. King Service Project. Lisa Roth, art teacher at Old Bonhomme Elementary, reports the program has been a big success. "The knitting group comes in twice a week during recess to sit together and knit," Lisa says, "We problem solve and chat just like an old fashioned quilting bee." The students have even taken the initiative to work on their own. "I have a young man from Saudi Arabia who speaks very little English," Lisa says. "He has made four hats; he taught his mother how to knit, and they are working together!" Seeing their older classmates knitting, third grade students have been eager to get started as well. "The kids are all wearing their hats around proudly," Lisa beams. "Now I just need to get them to finish their donation hats too!" Greg Tang, Jr. helps an Old Bonhomme Elementary student learn math through visual pattern games. The Making Math Matter grant brought Greg Tang, Jr.―a respected math educator, speaker, writer and online game developer―to four elementary schools to provide fresh, exciting perspectives on teaching and learning math. Every activity was designed to teach a critical skill or strategy while providing the repetition and practice required for mastery. Most importantly, the program remains true to the ideal that teaching and learning should be clever and fun. Feedback from all the elementary schools was positive. "The event was fun, and everyone learned so much!" reported Spoede math teacher Jennifer Gardner, who coordinated the grant's execution. The grant was funded jointly by the LEF, the Ladue School District and parent-teacher associations at Conway, Old Bonhomme, Reed and Spoede Elementary Schools. Tang's work is based on the system developed by his father, a New York Times bestselling author of educational books. For more information, please visit www.gregtangmath.com. For details about the more than 130 grants funded by the LEF, visit our website. The winning team of the Breakout EDU challenge in AP Statistics at Ladue Horton Watkins High School. The LEF is proud to help foster innovation, create meaningful change, and prepare students for a global economy through our LEF Grant Program. One of our recent grants tests the problem-solving abilities of students in a way no worksheet or traditional lesson can, by challenging them to break into a specially designed box. The Breakout EDU kit is a unique collection of resettable locks, boxes and items that can be used to play immersive classroom games. All games require critical thinking, collaboration, creativity and communication. 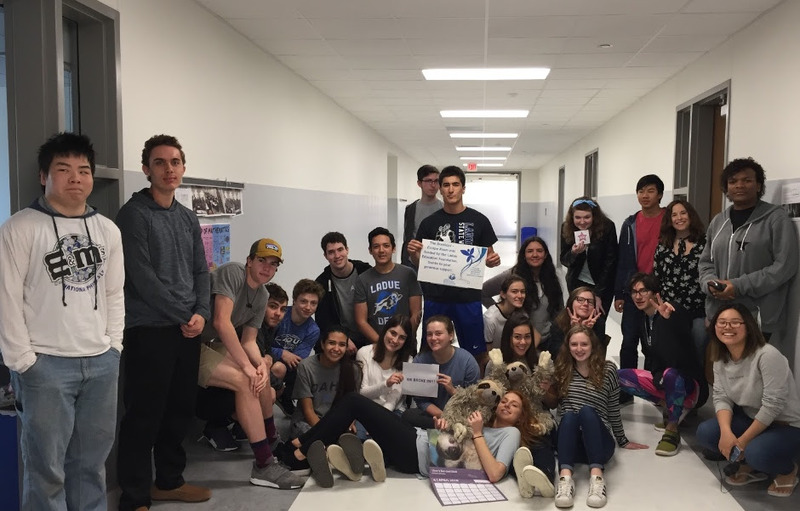 AP Statistics teacher Debbi Carson reported on the success of the challenge: "The students were engaged and excited," she said. "They delegated responsibility well and worked together. It was a beautiful thing!" Though Ms. Carson wrote the grant application, the kits can be used in a wide variety of subject areas. The Breakout EDU platform includes subject packs in over 700 topics. Teachers and students can build their own games as well. "Studies have shown students need to have more experiences working collaboratively with their peers to solve complex problems," says Andrea Bezzant, LEF Allocations Chair. "It just makes sense to fund programs that allow them to build skills they'll need in the working world."